Angst-Lesspork draws its inspiration from, and is a tribute to, the “Discworld” books of Terry Pratchett (describing a flat world travelling through space on the backs of four elephants which in turn stand on the back of a giant turtle…), and in particular the greatest city on the Circle Sea, Ankh-Morpork. The scene is urban with a tidal river to the front. Buildings are predominately timber-framed, and most are scratch-built from card. In keeping with the broad time period of the books (somewhere from the Middle ages to early Victorian), there are no internal-combustion road vehicles. Some buildings have illumination; we can imagine them to be oil or candle-lit. Some buildings have lit fires. You may be able to find the Alchemists’ Guildhall (complete with stuffed alligator), one of the many Watch houses and of course Mad Lord Snapcase’s Cruet set. The Post Office has recently installed a (working) Clacks tower. One problem in modelling in the genre is finding wizards, dwarfs, trolls and other out of the ordinary figures. Fortunately, the war-gaming fraternity could supply many of these figures. The Librarian, who appears occasionally, was a commissioned piece. Angst-Lesspork featured in the January 2013 issue of Railway Modeller and was awarded Best Layout by Public Vote at Pendle Forest MRS’s 2012 exhibition. 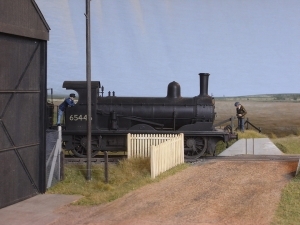 Calderwood is a 4mm/ft ’00’ finescale model of a fictional station on the Lancashire & Yorkshire Railway and is modelled in the 1900-1910 period. Calderwood is a fictional place that only exists in the minds of its constructors and is a wayside station with an island platform on the main line of the Lancashire and Yorkshire Railway company’s main line through the Calder Valley in west Yorkshire. 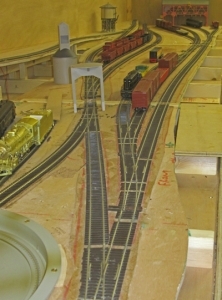 The layout comprises up and down main lines with corresponding loops; the down loop also has a refuge siding. From the up loop there is access to the small goods yard that has all the usual facilities – loading dock, coal yard and goods warehouse. Also on the up side there is access to a private siding, via a short incline to Calderwood Chemical Company. This firm has its own locomotive which moves the various wagons around the plant, these vehicles are propelled up the incline using a main line locomotive. Trackwork on the layout is C&L code 75 bullhead section with the scenic section ballasted with ash taken from the Cleckheaton branch at Liversedge. Point rodding and signal wires are also modelled. The booking hall is a copy of the now demolished building at Hipperholme and is scratchbuilt. All the building on the layout resemble L&Y prototypes and were made using a combination of aircraft ply and plasticard. The brick structures were made in the same way but the “bricks” were put on individually. Signals were kit built using the range of products from Model Signal Engineering, the operation of these is achieved with the use of memory wire. 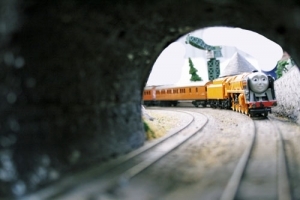 Locomotives were kit built with the exception of one which is scratch built. The kit built ones coming form London road Models and Craftsman etc. rolling stock is a mixture of scratch and kit built items marketed by D&S, David Geen and Slaters, etc. The scenery has a framework of plywood which is covered with plasticard from the Wills range of products. The operation of running loaded coal trains in both directions may seem a little odd, but the L&Y exported coal to both the east and west coasts. Although purely a L&Y line, the LNWR have running powers for their Hillhouse to Bradford service. Calderwood, as far as we know, bears no resemblance to the Scottish village of the same name near East Kilbride. 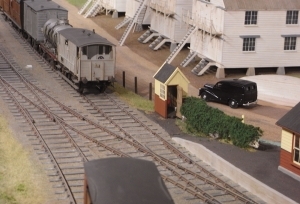 This is one of several layouts which are making their public debut at our exhibition, but this one has already been seen by several million people! 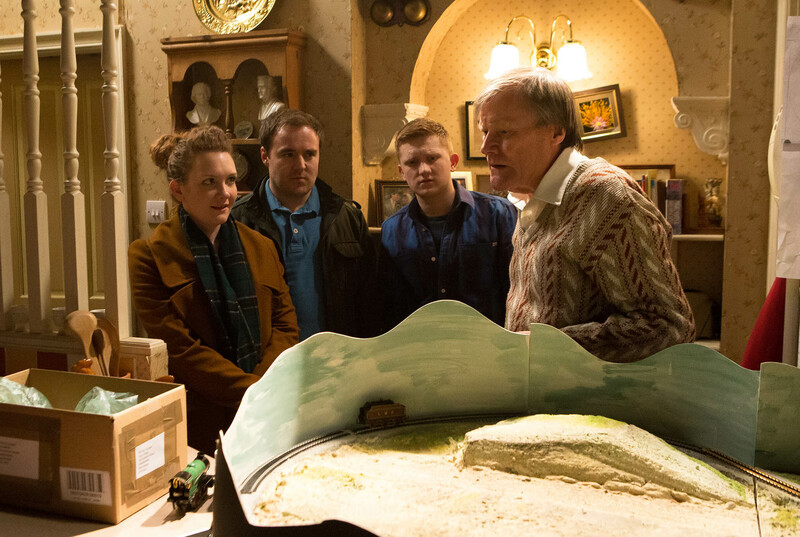 When Granada TV needed a model railway layout for one of the important story lines in Coronation Street in 2014, they approached MMRS for help, and one of our members acted as technical consultant, providing most of the rolling stock and control equipment, though the studio built the layout. Although a small section of it (about 8ft by 2 ft) has been on static display at Granada Studios Tours, this is the first time that the entire layout (about 13ft square) has been on public display and it will be working! Some narrow gauge enthusiasts may be wondering where Ffuglen Station is actually located on the Ffestiniog Railway. A Welsh-English dictionary should clarify. Ffuglen means “fictional; invented” as in “an imaginative creation or a pretence that does not represent actuality, but has been invented”. 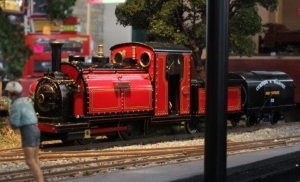 All the rolling stock is modelled from the Ffestiniog and Welsh Highland Railway. Very short trains have to be run as, it should be remembered, an average Ffestiniog train is over 16’ long in this scale. 16mm scale on 32mm gauge track (2 foot narrow gauge) is normally considered more suitable running outside in the garden. 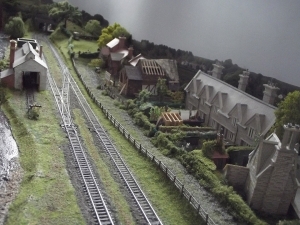 This layout tries to show that 16mm modelling can also be taken indoors. All the working locomotives are battery powered, with no electricity through the rails. There is also an “Inglenook” shunting puzzle and the public can operate many special scenic effects. 16mm scale narrow gauge is for everyone – not just the rich. Of course it’s possible to buy a ready-to-run steam loco for over a few thousand pounds, but it’s also possible to make yourself a small battery operated loco for under five pounds – and that includes the batteries. The operators of the layout all have their own garden line and so will only be too glad to answer questions and offer advice. You can also ask for a leaflet on the 16mm Narrow Gauge Modellers’ Association. Membership not only puts you in touch with fellow minded railway buffs at various national events, it also provides valuable information to get you started. 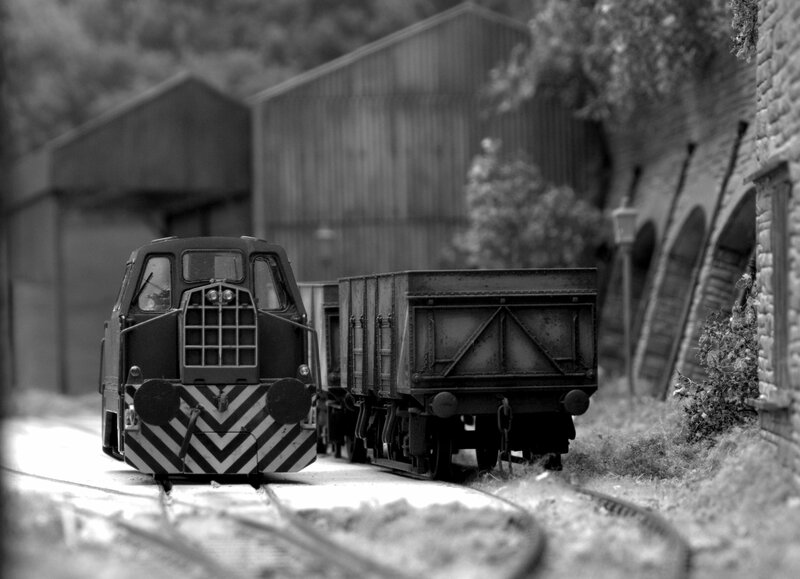 An industrial shunting layout set in the 1950s–60s, modelled to a scale of 7mm to the foot, 0-gauge. Until 2002, the Injector Works of Davies and Metcalfe (Engineers to Railways and Industry) stood across the road from the Romiley Methodist Railway Modellers’ clubroom in Romiley, Stockport. It was the inspiration for Gillan & Brown (Engineers to the World). In spite of being railway engineers, D&M never had a connection to the rail network. But in the operators’ imagination, Gillan & Brown does have one. This model shows a small part of their supposedly extensive system. With a little imagination and on a clear day, the drivers (at least) can see the entire system, right through to its connection with the BR main line! Track and scenery are scratch-built, with most of the locomotives and wagons assembled from kits. Many of the loads have been made from scrap. Can you identify the materials that have been saved from the rubbish bin? 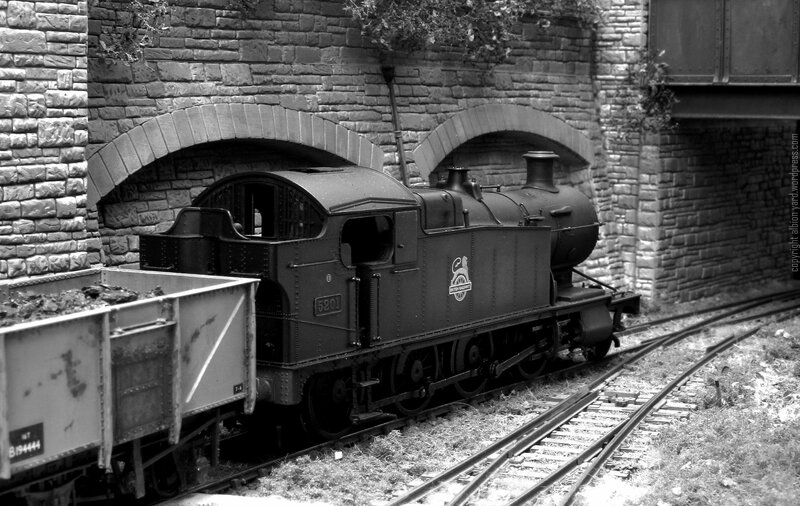 Several of the loads and their wagons have been described in Railway Modeller and the Gauge 0 Guild’s Gazette. 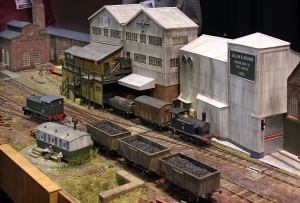 The layout itself was featured (as Plan of the Month) in Railway Modeller for September 2007 and was further described in the Gazette for August 2008. This is the US outline layout being constructed by the MMRS. The layout is based in the Appalachi an region of the mid/south eastern region of the USA and set in the “transition era” – which, in America, means the early 1950s. Therefore both steam and diesel locomotives can be used. Not only does this give us additional operational interest, it means we can have the fascinating apparatus that goes into a steam loco servicing point! This is coal country with a variety of railroads serving the region, so as two of the main “stock providing” members have rolling stock for both the Western Maryland and Chesapeake & Ohio railroads, a location was chosen where these two roads could meet. Greenbrier Junction is just such a place although we have only used the name rather than copying any actual track plans. What we wanted to do instead was to try to capture the feel of the place and also have something we could enjoy operating trains on, which would pretty much always have something moving. 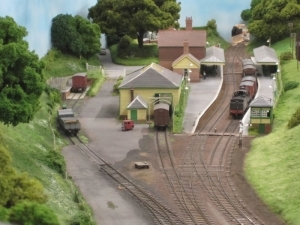 Herstmonceux is set in the early 1950s and is an OO (4mm to the foot) model which depicts a rural Sussex station on the Southern Region of the newly formed British Railways. Hironocho is an N gauge (1:150) model which represents the terminus of a minor independent railway in Japan. There are several railways of this type in Japan and the model aims to capture some of the typical features of these railways in a very small space. In the early twentieth century roads were generally poor and the railway was built to open up the area surrounding the city for development. This proved successful and the area has now become a busy suburb and the railway provides commuters, school children and shoppers access to the city centre. The station has been modernised with a small office block, this being financed by the sale of surplus land released by shortening the platforms to match the two car trains. At some point in its history the railway was electrified and it is now operated by second hand electric multiple units bought from other, larger railways. There is no connection with the now privatised Japanese National Railways network and the railway is completely self- contained. All maintenance of the rolling stock being carried out in the little depot adjacent to the station. This layout is a favourite as far as the kids are concerned! 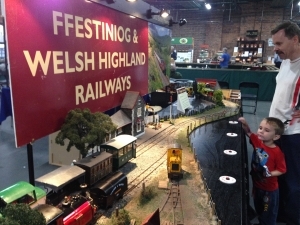 A mixture of apprentice teenage wizards and locomotives with amiable faces make this an ideal attraction for the youngsters at a model railway exhibition. A brand new layout in O gauge American outline which will depict the Laramie, Wyoming, motive power depot on the Union Pacific Railroad, home of the legendary Mallett “Big Boy” 4-8-8-4 locomotives. 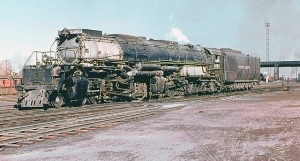 In the early 1940s the Union Pacific railroad produced one largest steam locomotive classes ever built. 25 Big Boys were built in response to the increased war time traffic. By the mid-50s they had been largely superseded by diesels and were put into store. The summers of 1957 & 58 saw them return to service for their final moment of glory pulling massive trains from the Californian fruit harvest east the 50 miles from Laramie and Cheyenne in Wyoming over the 8000ft Sherman Hill. 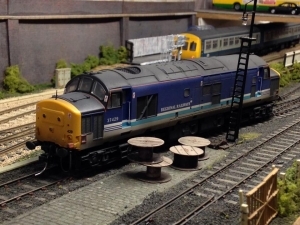 This new layout from well-known modeller Peter Kirmond aims to capture what it was like fuelling, watering and turning these monster beasts for this ‘swan song’. The railway through New Hey is on what was known as the “Oldham Loop”, the line that ran from Manchester Victoria, up Werneth Bank to Oldham, then on to Rochdale and back to Victoria. The line through New Hey (from Shaw to Rochdale East junction) was singled in the late 70’s but one part of the infrastructure still exists, the large cotton warehouse that is now part of the New Hey Carpets factory. The route closed to heavy rail traffic on 3rd October 2009, and is now part of the Metrolink tram network. All remaining traces left of the old station have been demolished. 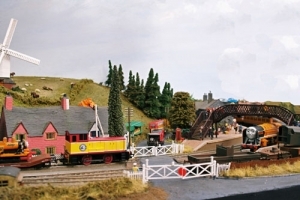 The model is of New Hey as it was roughly in the period from 1960 – 1968, and it is always the last two weeks of June on the layout. Why then? Because that’s when the local “Wakes” were. (The annual 2 week shutdown of the cotton mills in Oldham and Rochdale). As a result there were daily excursion trains, usually double headed if they were coming from the Oldham direction, and with coaches cobbled together from anything available. In addition there were regular local passenger, freight and parcels workings. The station was serviced by a twice daily pick up goods train working (Target 36) from Moston to Royton Junction and back. All the locos and stock are modelled on photographs of prototypes actually running on theline, and span the period modelled – therefore odd spots of blue in the DMU fleet may start to appear! Newfield is an area of the Staffordshire Potteries close to Tunstall (one of the six towns). The branch line for Newfield left the potteries loop line on a south facing junction between Tunstall and Pitts Hill. The line was accessed at Newfields junction by means of a ‘zig zag’ constructed in order to gain the required height to access what should have become a through line to Longport, although events overtook the construction of the line and only the section to Newfield was built. The original plan was for the line to be double track, indeed early maps and official documents show this. Only ever a goods line it was opened in October 1874 and closed to all traffic in August 1959. The line only ever handled local traffic in addition to traffic from the local tile and brick works and coal from Newfield and Clanway collieries in the early days. In these early days of the wharf the coal was delivered from the collieries by means of tubways. The last shaft at Clanway closed in the mid-1920s. 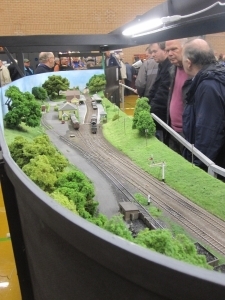 The layout, built to 3mm scale, is based on the track plan of the 1950s with the addition of a connecting line from Clanway Colliery (assumed to be still productive in 1953). 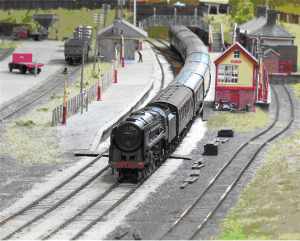 The layout will be seen in two distinct periods, 1920s North Staffordshire and 1950s BR LMR. The track work is by Peco the locomotives and rolling stock are a mixture of scratch built and products made available from the 3MM society, Parkside, Worsley Works, 3SMR and Judith Edge. Most of the highly decorated 1920s ‘period’ stock was built by the late Bernard Holland. 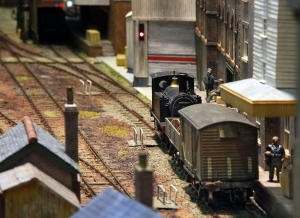 A brand new micro-layout from the renowned model maker Paul Marshall-Potter. It was featured in the October 2015 issue of Model Rail. 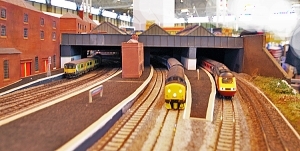 Stamford East was featured in the May 2014 edition of Railway Modeller. This is a “work in progress” layout. When finished it will have a mine and furnace served by local, main and mountain railways and is set in an alpine area, somewhere in present day Europe. It contains over 35 ft of track and since Z-gauge has a scale of 1 to 240, this represents some 1.6 miles of track – 2 kilometres. It is being developed to run on both DC or DCC, which is uncommon in Z-gauge. Thorncliffe is set in the BR Sectorisation era (1988-1991). Scale is 00, but with hand built track (C&L) and is operated from the front. The basic principle is a through, secondary line at therear with Sprinters and 1st generation DMUs operating to and from hidden sidings, whilst the operator shunts a steel terminal/freight yard at the front. The whole length is scenic and the operation is DCC, with sound. For further details, click here to visit our Facebook page. This layout is to a large extent inspired by the work of Peter Kazer. I wanted to build a minimum space O gauge layout with a smallish rolling stock requirement but with a potential for interesting scenic work and a real sense of place. Peter’s models, particularly “Corris” showed me the way and convinced me that a good enough model would be interesting to the viewer even if the operating potential was a little limited. Whether I have succeeded or not is for you to judge. I wanted to model standard gauge, rather than the narrow gauge which Peter specialises in and an old friend and ex MMRS member, Bob Rayner, pointed me towards the joys of J15s, salt marshes, flatness, warped weatherboard buildings and the Kelvedon and Tollesbury Light Railway in particular. I have messed about with history and geography and moved the terminus from it’s real place at the isolated pier on the river Blackwater, which was totally unsuccessful and closed during the first world war, to the busy little “hard” at the head of Woodrolfe Creek. This served the village of Tollesbury for centuries and still does, being a busy yachting centre these days. I have also invented a maltings to generate some freight traffic. This is not so unlikely as the coast and creeks of Essex are littered with the things. The period modelled is the first few years of nationalisation. In reality the line closed in 1951 except for the goods service to Tiptree (where the jam comes from), half way along the line. Much of the rolling stock and all of the building are scratch built as that is my particular interest – hence the desire for a smallish rolling stock requirement! 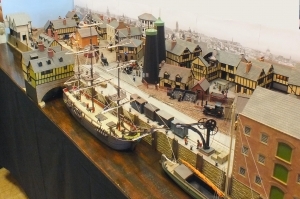 I would never even have attempted this project if it had not been for my membership of Manchester Model Railway Society who, over nearly thirty years, have taught me everything I know about model making. 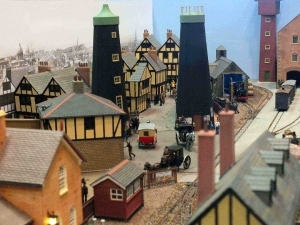 Whiteacres is the Stafford Railway Circle’s flagship layout and is set in the Staffordshire/Derbyshire area. It is a multi-level continuous run layout with the high level representing a junction on a fictitious former LNWR route from Birmingham to Derby and Nottingham (on the assumption that the ‘real’ ex MR lines were not built) and the low level a fictitious ex GCR line from Loughborough to Derby with a link to the high level station of which only one throat and part of the platforms and buildings are modelled. The main scenic feature is the river valley which dictates how the railway and other transport routes have been developed necessitating a major stone viaduct and girder bridges to carry the railway over the river which is canalised and is used for both pleasure and commercial traffic. One throat of the station is modelled with an overall roof and platforms. The area around the station and into the valley includes various roads and railway related buildings plus industrial, retail and domestic buildings representing a typical large country town. Most of the buildings are scratch built or are heavily modified kits or resin mouldings. At the opposite end of the layout is a junction from the main high level line to a secondary route (to Nottingham) and a goods line. On the low level there is also a junction leading to the high level with the main route leading to the three front scenic boards. These boards feature an industrial facility with rail, road and water access with a lock leading from the navigable river to a transhipment basin. There is also a small diesel maintenance and re-fuelling depot. The low level lines include a working level crossing. There are 2 fiddle yards for the low level lines allowing independent operation. Photographs by Peter Griffiths at the Warley National Railway Exhibition 2012.